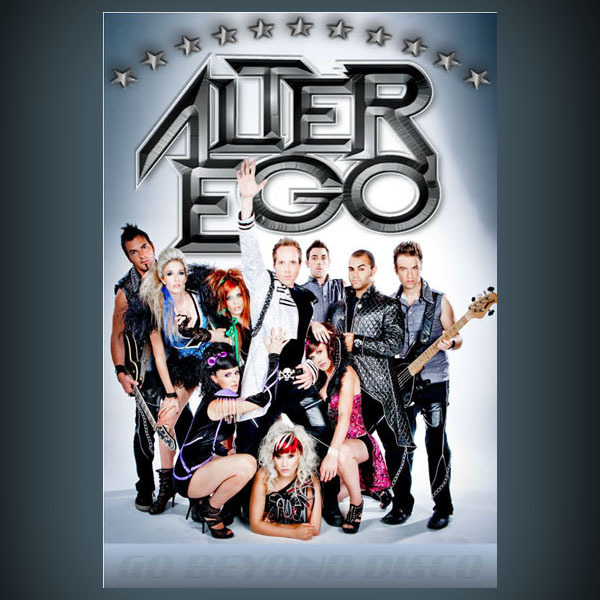 ALTER EGO | Love Productions Inc.
Alter Ego is the Ultimate tribute cover band performing music from the Eurhythmics, Cyndi Lauper, Madonna, Chic, Bee Gees, Spice Girls, Billy Idol, Black Eyed Peas, LMFAO, Lady Gaga, Michael Jackson, Katy Perry, Bon Jovi, ACDC. Alter Ego is a non-stop all dance repertoire featuring the best of 70’s disco, 80’s rock, 90’s Pop, and even Lady Gaga. Ten band members sing & dance with 95 Dazzling costume changes giving Alter Ego an MTV Video feel to it. When Alter Ego dance band takes the stage it is evident that the party has begun. This group sends an electric charge right into the hearts of the spectators. Their show is designed to interact with the audience and keep them on the dance floor. And for those who don’t wish to dance, Alter Ego’s show is very visual and entertaining to watch! Alter Ego is a non-stop all dance repertoire featuring the best of 70’s disco, 80’s rock, 90’s Pop, and even Lady Gaga. Ten band members Sings & Dance with 95 Dazzling costume changes, this act has a MTV Video feel to it. Alter Ego travels all around the world performing at Festivals, Corporate Events and Private Parties; their high energy performaces elevates your mood! Alter Ego relentlessly performs from the Beginning to the End of the show!